It costs less to buy and operate a boat than you may think. Surveys show people who don't own a boat believe boat prices are 30 per cent or more higher than they actually are. While prices may vary from new and used, on average you can purchase a small outboard-operated family runabout and trailer for less than $12,000. In addition, most new pleasure boats can also be financed, just like your car, but since banks recognize that boats depreciate very slowly, they can be financed at lower costs and terms from 2 to 15 years. A fishing boat with livewell, carpeted floor and navigation lights, complete with electric start motor, steering console and trailer retails for less than $8,000. The versatility of boating cannot be underestimated. Compare the number of outdoor experiences you can enjoy in a boat with other sports - fishing, water-skiing, camping, cottaging and exploring. 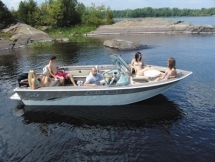 A boat is a summer cottage, a fishing platform or an outdoor patio rolled into one special long lasting product! Boating really is for everyone! All family members can participate, creating their own unique, personalized version of the boating experience. Whether you are a dedicated, competitive water skier or a devout fisherman, there are no barriers to boating. To learn more about the boating experience, call us at 1-866-627-7357 or (519) 662-1650. Call us to find out about boating regulations, ownership matters, financing or maintenance. The boating season can run from April till October and some of our fishermen are still fishing in December. How's that for an extended season! Summer is just around the corner - take up boating and see what all the fun is about! Do you have your Operators' Card yet? Do you know when you will be required to have one? Do you know how to obtain one? For more information check out www.discoverboating.ca.